The Denver Pioneers host the 2008 Canadian Intrauniversity Sport (CIS) Hockey Champion University of Alberta Golden Bears to start the season with the annual DU home exhibition game against a Canadian University. These two teams have a series history that dates back to Denver’s first season of hockey in 1949, with the Pioneers sporting a 23-7-3 series advantage over the Golden Bears, with DU scoring 194 goals and letting in 121 over the years. The last time the teams met in 2001, DU hammered the Bears by a 6-2 count. Alberta’s last win over the Pioneers came in 1999, with a 5-4 OT victory. This years’ Golden Bears squad has already played 5 pre-season games, and won four of them. In the home opener, the Bears bombed Concordia (Alta.) College 12-2, then lost a close home contest to the Edmonton Oiler Rookies by a 3-2 count before a capacity crowd on Sept. 15, despite outshooting the young Oiler pros 37-27. The Bears then traveled to Saskatoon for the annual Huskie Classic Pre-season Tournament, where they beat the University of Saskatchewan Huskies, 4-3 and the University of Manitoba Bison, 2-1. Jason Fransoo: Fransoo made his debut in Golden Bear silks during the Oiler rookie game last season and promptly set-up the game winning goal. The smooth skating and passing defender will take over the top PP unit after notching 14 points in 24 games last season. Put up 43 points in 71 games for Everett (WHL) in 2006-07. Aaron Sorochan: Sorochan was absolutely brilliant in the CIS gold medal game last season, where he made 40 saves and helped the Bears to their 13th National title and third in the last four years. He finished second among Conference goalies in 2007-08 with a 2.52 GAA an 18-5-0 record and a.899 save percentage. Ian McDonald: The six-foot-three, 210-pound third year center finished second in Golden Bear scoring last season with 28 points in 28 games and was named the University Cup MVP after scoring four goals and two assists to lead all players at the National tournament. Eric Hunter: Named to the CIS All-Rookie Team after scoring 26 points in 24 games last season. Hunter is a force on the ice as the 6’1” 194lbs winger likes to get involved. 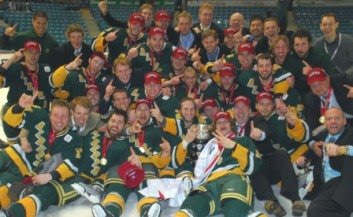 The University of Alberta (U of A) is the best and most decorated college hockey program in all of Canada. Since the formation of the CIAU in 1961 (now known as the CIS) the Golden Bears have won an amazing 13 University Cups as Canadian national champions, including the last three straight in 2008, 2007 and 2006. Six of those titles came under legendary coach Drake won 17 conference titles to go with the six national crowns, and also coached the Alberta football team, incredibly winning national titles in both sports in the same season in 1968. He would also go on to coach Team Canada in the 1980 Olympics as well briefly with the Edmonton Oilers. He retired as the winningest college hockey coach in North America, and the arena at the U of A is named in his honor. The University of Alberta is celebrating the 100th year of classes this year as the first classes took place in 1908. Growth was slow in the early years, as the school had about 5,000 students by 1958, but exploded in the modern era to day’s enrollment to almost 37,000, with 73% from Alberta. It is generally considered to be one of Canada’s top 5 universities today, and academic strengths in research and the sciences. If you want to see the school without leaving your warm and comfy living room, you can rent one of these movies as The U of A campus has appeared several times on the screen, including Running Brave (1983) starring Robbie Benson, Small Sacrifices (1989) starring Farrah Fawcett, and Angel Square (1990) with Ned Beatty. A representation of the topography of Alberta rendered in the colors of the University. At the base is a prairie wheat field symbolizing Alberta's agricultural industry. The wavy gold line above suggests the hills and rivers of Alberta and, in particular, the setting of the University campus. The top of the shield is in gold and separated from the rest of the shield by a line suggesting the Rocky Mountains. The book of learning dominates the design. A Grand-Duc d'Amérique, or Great Horned Owl, the provincial bird and an accepted symbol of knowledge. The Pronghorn, taken from the Provincial Coat of Arms, and the golden bear, mascot of the University. Both wear collars of the University colors, as does the owl. While the Bears nickname was first mentioned in a school athletics road event in Winnipeg in 1931-32, the specific men’s ports team to which it was first applied is unclear. Copies of the March 10, 1933 Gateway school newspaper describe a game in which the university’s Alberta Bears basketball team fell to the Calgary Moose Domers 37-36 in one of the best basketball games of that era, a provincial playoff game at Crescent Heights Gym in Calgary. The University of Alberta Golden Bear logo was designed in the mid 1960s by U of A Athletic Director Ed Zemrau and his friend, Keith Randolph. If the name Ed Zemrau sounds familiar to Pioneer fans, it should, because Zemrau was a DU all-American and captain of the 1958 NCAA Championship hockey team, the first of DU’s seven national championship teams. “GUBA” (which stands for the rather grandiose title of “Great University Bear of Alberta”) is the mascot of U of A’s men’s teams. GUBA made his debut on campus in early seventies —the creation of Chuck Moser, a then U of A assistant athletic director who was inspired by seeing BYU’s active cougar mascot while at a basketball tournament in Hawaii, while Honeymooning with his wife. Moser reportedly turned to his wife and said, "This is what I'm going to do when I get home - I'm going to get a mascot for the Golden Bears." Student Dave Zaharko, who went on to become a CFL linebacker, was credited with generating the mascot’s name as part of a student contest. According to the University’s web site, The original suggestion for green and gold University colors came from Marion Kirby Alexander, who drew her inspiration from the autumn colors of the river valley below the campus. Her husband, William Hardy Alexander, Professor of Classics, relayed the suggestion to the Faculty meeting of 5 October 1908, the University Senate approved the combination of green and gold as particularly appropriate to the new University of Alberta. The green represents the wide stretches of prairie land flanked by deep spruce forests and is symbolic of hope and optimism; the gold represents the golden harvest fields and is symbolic of the light of knowledge. And ever hold thine honor dear. For most of us, probably the most famous U of A alumni are those connected to the game of hockey. Former longtime NHL president Clarence Campbell (a U of A Rhodes Scholar) heads the list, followed by George Kingston ’60, who would go on to become the first head coach of the San Jose Sharks (92-93). Dr. Randy Gregg, an orthopedic surgeon who spent 10 NHL years playing on the Edmonton Oilers on their great teams in the mid 80s, where he won 5 Stanley Cups. Daryl Katz, the Billionaire owner of the Edmonton Oilers is also a U of A Alumnus. There are 13 former Golden Bear hockey players who saw NHL time, the most recent of whom are Cory Cross, who played for six NHL teams between 1993 and 2006 and Brent Severyn, who spent 10 years in the NHL with six different reams between 1989 and 1999, including some time with the Colorado Avalanche in 1996-1997. The Golden Bears also boast a rarity – a player who played in the NHL BEFORE playing college hockey (yes – ex-pros are eligible in Canada to play college hockey). His name was Dean Clark, who played for the Edmonton Oilers in 1983-84, and played for the U of A in 1986-87. Edmonton, Alberta (City population 750,000) with a metro area population of just over a million people, is the northernmost North American city to have a million or more in population. It’s the booming Oil and Gas hub of northern Alberta, and while it may not be as large as Calgary, it has the distinction of being the provincial capital of Alberta. Average temperatures in January is 10 degrees Fahrenheit. Brr. Edmonton shares a fierce rivalry with the City of Calgary for Alberta dominance, and that civic and political rivalry spills over into all sports, including the NHL (Oilers vs Flames). The CFL (Edmonton Eskimos vs. Calgary Stampeders) and into Universities, where the University of Alberta Golden Bears hate the University of Calgary Dinos. Denver normally kicks around Canadian competition, but expect this game to be closer for several reasons. Defending CIS Champions – This Alberta program is the best in Canada, and that’s a big factor. They’ve already played 5 more games this year than DU has, including a game against the Edmonton Oilers Rookies. Age and Experience – Typically, Canadian university teams are older and more experienced than their NCAA counterparts, which sometimes helps to offset the NCAA talent advantage. We doubt that DU coaches have seen this UA team play this year, so there is the element of surprise….